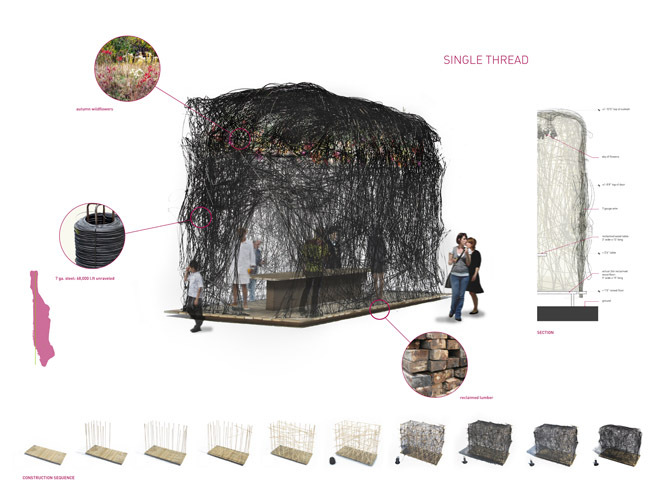 Read more about the sukkah and the rules of this design contest. Common, single, spun, continuous, mythical, spool of, and the logic of Ariadne's. This sukkah is constructed by threading a single spool of wire around intersections of a temporary bamboo scaffold, supported by a plank floor made of reclaimed lumber. Once the continuous wire is fully unraveled from the spool, the scaffolding is removed - leaving a rigid yet porous enclosure of singular materiality and perplexing simplicity. This process can be reversed and repeated: the wire is unthreaded and raveled back onto the spool, and transported to the next site. Each unraveling and threading produces new kinks and bends that will become part of the texture of each new sukkah. The dimensions are variable and each wrapping will produce a unique form. As the scaffold is removed pole-by-pole the thick ‘cloth’ of wire will settle into a taut self-determined structure. Its loose fabric allows for a field of fresh flowers to be hung and dried above the table. The frugal and temporal nature of this sukkah is expressed by a single line, the designer’s and craftsperson’s most simple device, both drawing and object in one. The dense 2000 lb spool of wire; its beginning and end brackets a long meandering line that contains all possibilities or none. A simple line between two points nearly the length of Manhattan or an elusive tangle of indeterminate thickness. Extensive full-scale tests with the actual material will be performed to develop proper wrapping patterns to ensure structural soundness and guarantee occupant safety.